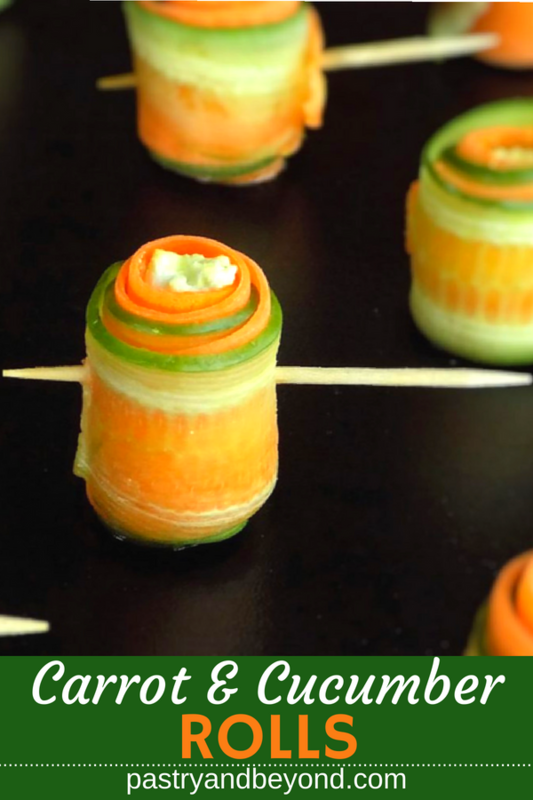 These healthy carrot and cucumber rolls are very refreshing and yummy! 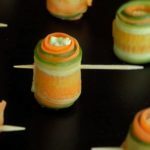 Today I go beyond the pastry and share my carrot-cucumber rolls recipe. You can make these rolls for any occasion. They are healthy and very easy to make. The filling of these rolls is cream cheese and curry. Cream cheese and curry make a great combination and they are perfect with cucumber and carrot. Besides all these, they look very pretty. Last summer I made these with my niece and we filled the rolls with cream cheese and curry. She loved them. If you don’t like curry, you can replace it with another spice or just make it plain with cream cheese. We made it plain too. Cream cheese, cucumber and carrot are very refreshing but I think curry makes these rolls more appetizing. If you like curry, you should try my savory curry cookies. They are delicious! 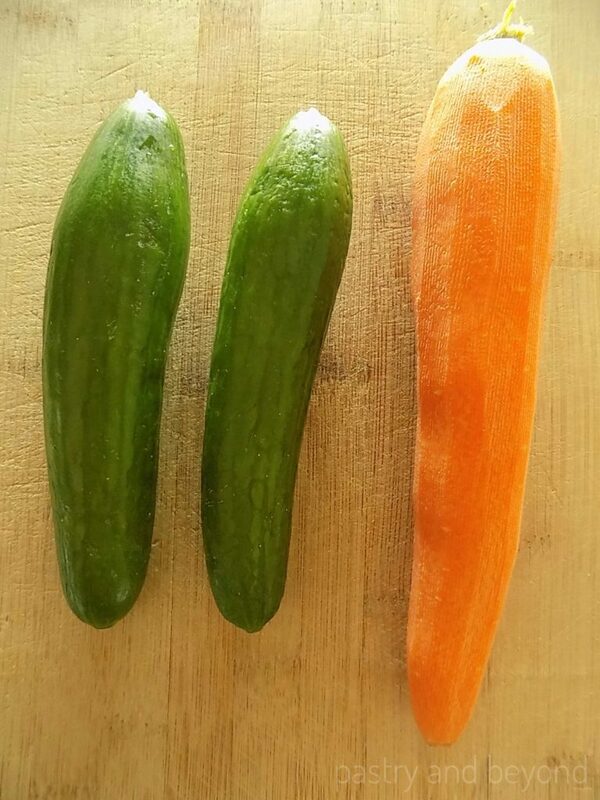 I use 2 medium-size cucumbers and 1 large carrot. First, I gently peel the cucumber with a vegetable peeler. I try not to hit the seeds as cucumber is too gentle. I leave the first piece with a skin aside and continue peeling. When I have a hard time to peel because of the seeds, I turn over the other side and start peeling from there. If your strips are not perfect, don’t worry, you can use them. 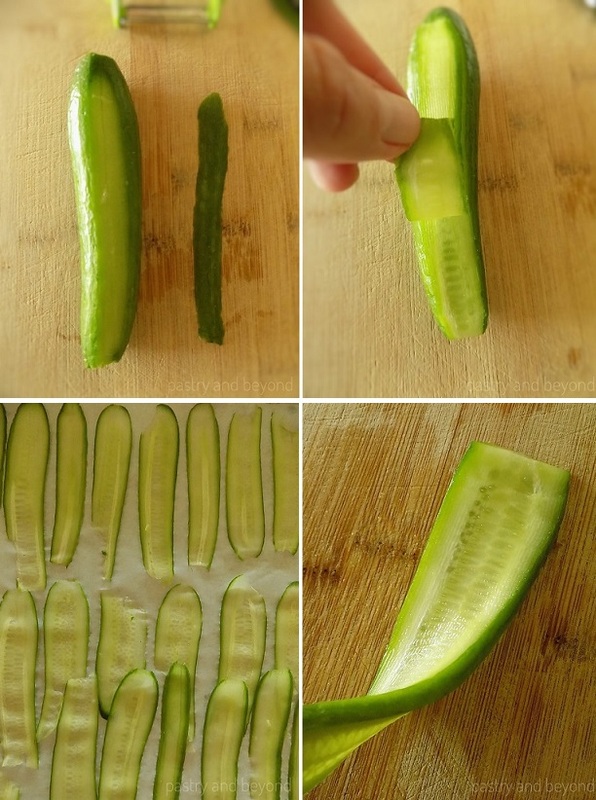 From the fourth picture below, you can see how much cucumber is left without peeling-not too much. Then, I peel the carrot with a vegetable peeler. As I continue peeling, the strips become wider. Again, the strips don’t have to be perfect, you can still use them. 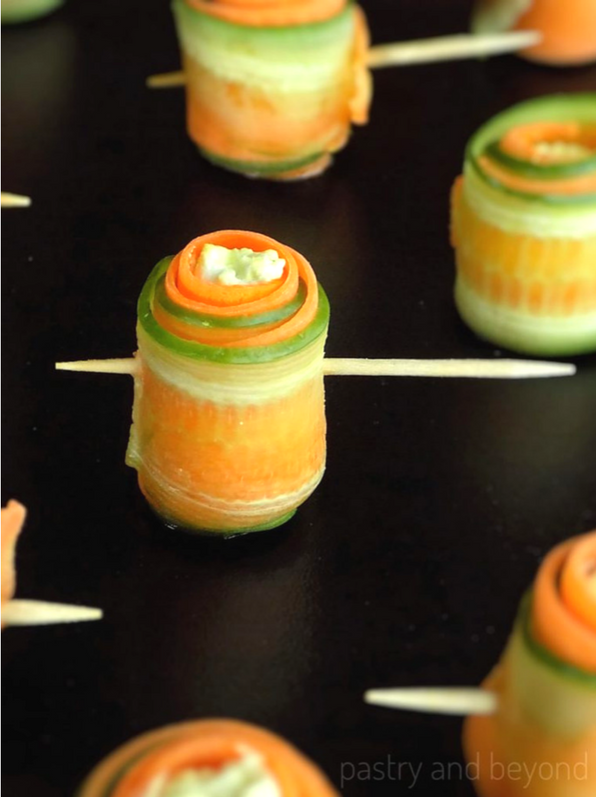 You can make these healthy carrot and cucumber rolls easily! They are very refreshing and yummy, perfect for any occasion! Wash and dry the carrot and cucumbers. Gently peel the cucumbers into strips with a vegetable peeler. Leave the skin aside and continue peeling. If you have a hard time peeling because of the seeds, turn over the other side and start peeling from there. Set aside the cucumber strips. 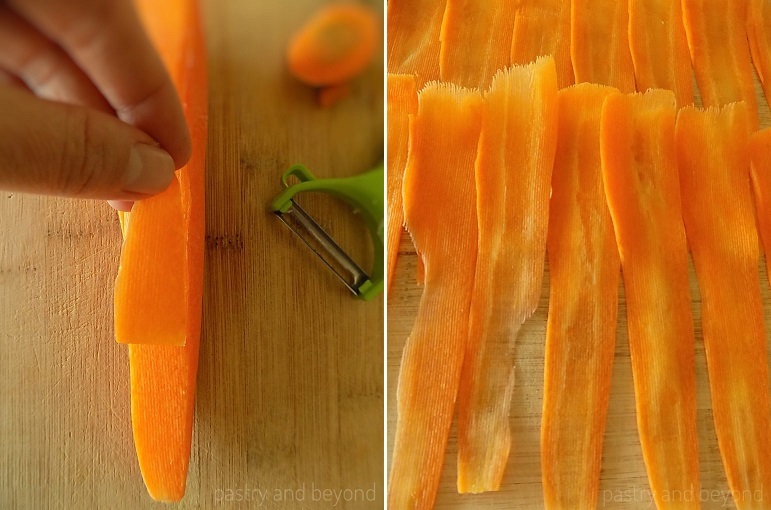 Peel the carrot with a vegetable peeler. Set aside. 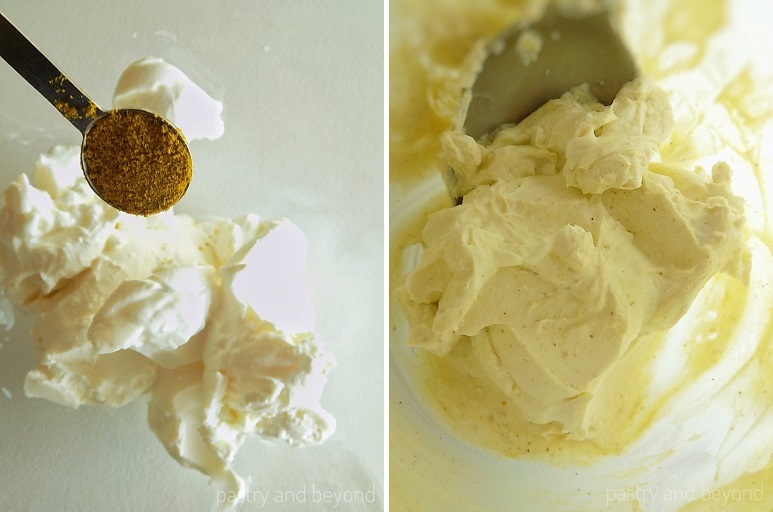 Combine cream cheese and curry powder in a small bowl with a spoon. 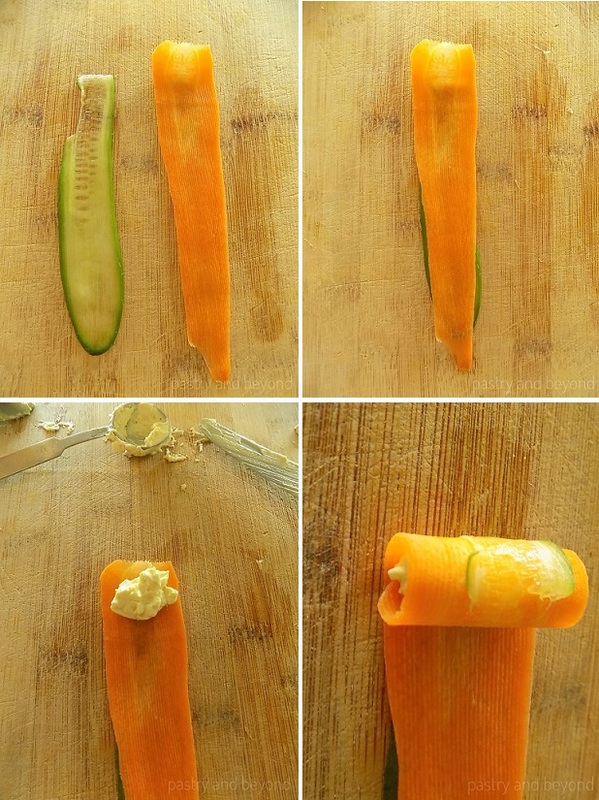 Center carrot strip over cucumber strip. Take one teaspoon of curry cream cheese and using a knife, lay it as much as you need on wide end of the carrot. 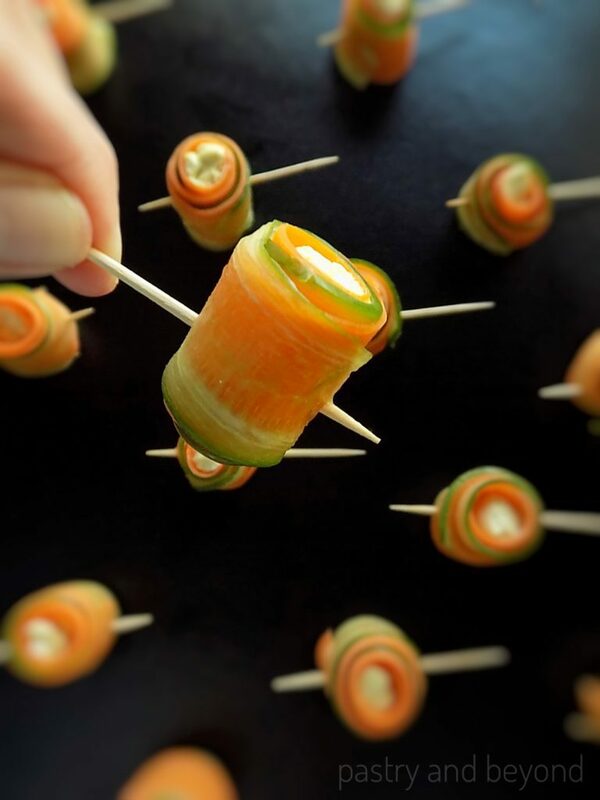 Roll the carrot cucumber strips tightly and secure with a toothpick. *You can replace curry powder with another spice or you can use plain cream cheese.